Some of the most important Films of all time are based on an inherent journey, or path, that the characters must go through. More often than not, this path is usually represented by an analysis or timeline diagram. 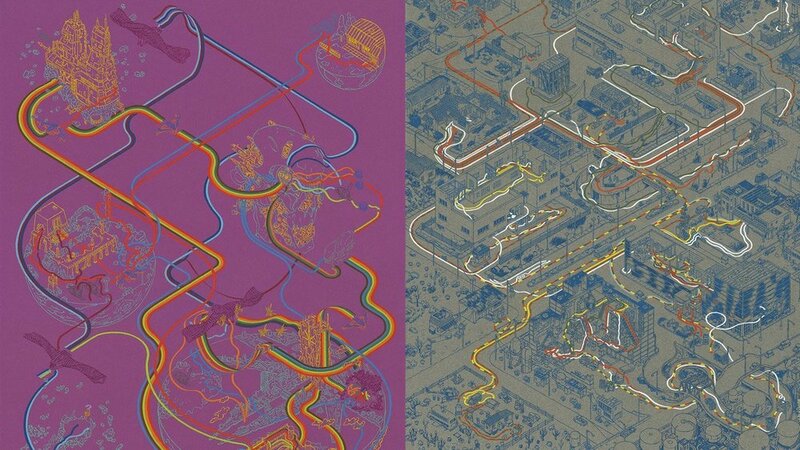 What Andrew DeGraff, an incredibly talented Illustrator and Artist, has managed to do with his Cinemaps Series is visually represent the journey of various characters through Architectural Spaces, Buildings and Locations in a new, captivating way. 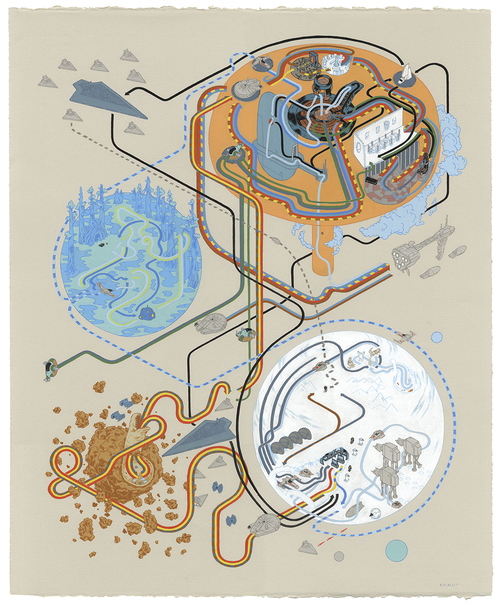 In an exclusive interview with Interiors, we talked to Andrew DeGraff about his masterful Cinemaps Series. Can you tell us about your background? When did you first realize you wanted to be an Illustrator and Artist? I grew up in Albany, New York and then later out in the country in the county next door. My Dad's a lawyer and my Mom was a teacher and honestly it was a pretty idyllic childhood with my big brother. I knew pretty early on that art was my thing, and my parents were always supportive. My Dad used to bring home stacks of legal documents with blank backs and I would sit there and draw for hours. I think my Mom and Dad held out a little hope that I'd end up doing something else other than art. Fortunately, we had a few other artists in the family so the idea of doing art professionally actually seemed feasible. Basically I was and am really, really lucky. How did the Cinemaps Series come about? Was there a particular Film that inspired it? Or was it the general idea/concept? The Cinemaps Series was built out of a stew of things that started swimming around in my head in 2009/2010. I had been illustrating maps and things like board games for clients, and I was having a lot of fun. I had been doing so much figurative work for so long that it was like a breath of fresh air to deal more with landscape and architecture. At the same time, I was also participating in pop culture shows in Los Angeles and the work in those shows (mine as well) was almost entirely figurative. The pieces were also highly dependent on very specific scenes of a Film or TV show. It wasn't that I didn't like the work - I love that stuff - but I saw an opening to try something different. Basically, I was thinking about this question: If I removed the people and just showed you the scenery, would you replay the scene or even the entire film in your head? The map and board game illustrations helped me develop some of the concepts and tools to think about doing a large swath of a film and then eventually entire films. It started with an almost "ant farm-ish" diagram of the underground section of The Goonies, then a map of the camp from Wet, Hot, American Summer, and then a North By Northwest map that utilized a red arrow to follow Cary Grant's character through the entire film cribbed from Saul Bass' title design. They were pretty expensive for pop pieces, but to my surprise, they all sold and people seemed really into them. It then became about trying to get the biggest stories in film all into one painting: Indiana Jones, Star Wars, really any big epic from my childhood. After I'd finished about 12 or so, I decided I really wanted to continue the series and put them all together in a book. Can you describe what your process is like putting together a Cinemap? Because of the incredible amount of detail and information, how long does the average piece take you? I generally watch the movie once or twice (generally I've seen it many times before), pausing often to take notes, notate the times when there's good establishing shots and make a sort of "character flowchart". That way, I know where the characters need to end up and what all the locations are. Sometimes, I focus on how they move about: what type of car, spaceship, etc. in case I want to use it in the map. Then, I gather all the visual and photo references I can: Still-Frames, On-Set Photography, Scene Diagrams, Models, Concept Work, even LEGO recreations of the scene so I can reconstruct it in the "round" for the painting. This part can take a while, since sets just have to work for the shot and we are easily duped by some smart camera work into believing certain cinematic spaces. Upon deeper investigation, quite a few are pretty implausible and often, completely impossible. I usually do a 3 to 6 hour sketch to try to tie it all together and trouble shoot and if all seems well, I begin pencils on the finish paper. All in all with watching the film, notes, and sketches, we're probably at about 12 to 20 hours of work. Pencils can run from 5 to 30 hours depending on the size, the degree of detail, and the film's scope. I generally paint the maps with gouache and that can take a while. Generally, the process takes about 60 - 200 hours, but I've had a few of the more complicated, more rendered maps run months at around 600 - 1,000 hours. The average map though usually ends up being about 7 - 14 long workdays. It's a long haul, but it's wonderfully meditative. Which Cinemap has been your favorite to create and why? Are there any that receive more acclaim from fans? Also, what type of Film usually makes for a great Cinemap? Mapping a favorite film is a treat. Raiders of the Lost Ark, Empire Strikes Back, Back to the Future - for me, those are nearly perfect movies. But when you really have to watch a film looking at every edit, every shot, and every twist, then every film is an ocean of information. Plus, you're trying to deal with things like time travel, important cameos, flashbacks, dream sequences, and music montages that don't necessarily translate directly to something like mapping physical motion through a scene. Every film is interesting and brings it's own challenges. That may sound overly diplomatic, but I've really found it to be true. It's the old adage: "There's no small films, only small illustrative mappers." There's a few that have been pretty big hits. The first Star Wars (Hope, Empire, and Jedi) were a huge thing for me. I did a big map of all 3 of The Lord of the Rings movies in one map which made some nice viral rounds. Of course, anything Star Wars-related is big. If the film has a big following, they generally do pretty well. I think the films that make the easiest and most fluid, clear maps are traditional adventure epics. They're more work to set up and research, but they lend themselves well to a more traditional map presentation. You can really show the full scope of the film's vision: the design, the chases, and the action. Personally, I like mapping something conceptually strange like time travel, which forces you to find an interesting solution. For Back to the Future, I created a 1985 Hill Valley that exists directly above a 1955 version of Hill Valley so you can compare and contrast the differences. When Marty travels back in time, he "descends" to the lower 1955 level and then later, straight back up to 1985. I have found some unconventional movies make really interesting maps, too. The Breakfast Club was a strange challenge since it practically takes place all in one building, and mostly in one room. There's almost no concept of time, and very little linear plot. While it doesn't make a for a clear, conventional readable map, the density of the action turns it into a lovely tangle, and I was really happy with it came out. So many of the movies I've mapped - like Star Wars, Back to the Future or The Breakfast Club - they're movies we put on to keep us company, but we don't always engage with fully. They stagnate in our head space, and we don't experience the same joy we once did with them. My hope is that the maps reveal, or rekindle, a newness in the experience, and maybe bring a new concept or way to unpack the film to the viewer.